In celebration of Eid'l Fitr, the end of the fasting month of Ramadan (a holiday in the Philippines), for Muslim brothers, here's a list of Mosques in various locations in Metro Manila, provided by a Muslim friend of Tutubi. near Quezon Bridge. This is highly visible landmark so it's easy to go there even without directions. Source: List given by Muslim friend of Tutubi. Tutubi just added a few mosques not on his friend's list as well as how to commute information. Telephone numbers and Driving Directions to follow once available. 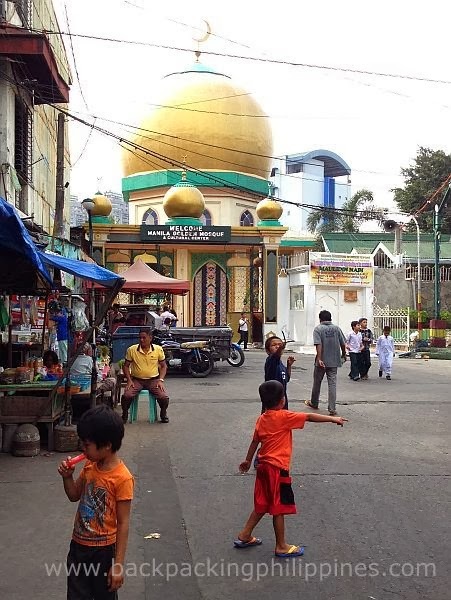 The oldest Mosque in the Philippines is Sheikh Karimul Makhdum Mosque at the Tubig Indangan, Simunul, Tawi-Tawi constructed by an Arabian Missionary who introduces Islam in the are in 1380.
dami na palang mosque sa metro manila. i only know the one in quaipo, baclaran and maharlika village. wooo.. I didn't realize there's so many mosques in Manila ! Man, things have really changed a lot since I was living there. This post is interesting...I know there's a mosque in quiapo but i didn't know there are other mosques in Metro Manila. It would be interesting to visit them but entry may not be allowed. Here, there is mosque in every corner. In Oman, I was able to visit Sultan Qaboos Grand Mosque because they allow tourist to enter but in proper attire. This is a wonderful list, wish I had seen this before Eid since I'm a Muslim staying in Quezon City. To my surprise (and joy!) I heard the evening call to prayer while visiting a friend in the La Vista subdivision, but I couldn't tell where it was coming from. Could you please include the Al Furqan Mosque in the lists of Mosques outside Manila. The mosque was newly built located in Brgy. Sinasajan Penaranda Nueva Ecija. The land was donated to AFIA by Tejada family a Balik Islam in Makkah, Saudi Arabia.It has a floor area of 100 sq. meter with the total area including the sorrounding fenced area of 400 sq. meter. The mosque includes wudhu area, parking space, imam house (back portion)and an open space or gathering. The mosque outside paint is combination of apple green and leaf green while inside was yellow and orange.I hope I can also post the photo of the mosque for the viewer or for any muslim nearby or visitors wanted to see the said mosque. More power to your website. MAy Allah shower us blessings for the good deeds. Good day! Any odea on how to commute going to teh Green Mosque in Taguig? I hope they would build more mosques at South area of Manila. hi im from san pablo city , laguna. I will just ask if there is a mosque near my place. im a newly converted muslim and i would really want to know if there is a muslim community here. thanks so much. my cousin is looking for the main mosque and we have info that it's in Quezon City,,,which one is the main? Alhamdulillah yr comprehensive info is very helpful. My family will be going to Donsol and Surigao does anyone know if there are any muslim community or mosques in these area? there's a mosque in makati inside the indonesian embassy along de la costa street, salcedo village. good day! i would like to ask if you know of any mosque in bf homes, paranaque city? thank you! san po banda ang pinakamalapit na mosque dito sa mandaluyong? dear brother, i'm in manilla for a conference, at Eastwood city, my return flight is on friday @ 3.00pm. pls tell me a mosque for jumma prayers either close to the airport or on my way to the airport from eastwood city? Assalamaleikum. To anonymous : the nearest mosque to the EASTWOOD are GREENHILLS & PASIG. but ive never been to pasig, so i can only recommend GREENHILLS. it is located at greenhilss shopping center. You will see lots of muslim around. We actually go there most of the times. RAmadhan and when I need to buy HALAL chicken :). its just a 15-20 minutes ride from Eastwood. Ride a bus or public vehicle. and ask the driver to stop somewhere in greenhills. Is therw any prayer room in makati city? Is there any musalla in makati city? bakit andami na mosque sa manila? hindi na lang sa mindanao magtayo? You have to just enter the mall connected to MRT station of Guadalupe and go to the basement.There are prayer rooms for Male as well as females. Greetings! I will be going to blue mosque today. Im a christian starting to learn and discover the wonders of Islam. My question is (Is it ok if i enter the mosque & listens to the teachings?) Does anyone know the contact number of the blue mosque? For me to be able to ask. Please help me with any nearby mosque to manila - Robinson Cyber Gate 2 place. I will be staying there for another 3 months so need your help on same. I am so happy to learn that Allah has blessed you with the knowledge of right path and you have decided learn about Islam. Yes, It is absoluteley fine for a non muslim into a mosque but please please wear proper cloths and take a bath before you go. Allah will help you to continue on right path. Please let me know if you still need any teacher to learn Islam and I’ll be more than happy to get you one or send you links/videos so that you can learn all the essentials of Islam. Electronic Technician - 2 Nos. A/C Technician - 2 Nos. Qualified candidates will be called directly for an interview, Employment visa will be send agency in Philippines and hired applicants are totally free from placements fees.. Hoping for positive feedback to all readers and interested applicants..
Dear All, Could you please let me know the Jumma timing for greenHills mosque??. Is it the same as that of Zuhr (12:06 PM)?? I do not see a special timing mentioned for Jumma (Friday Zuhr prayer). panu po ang proseso nang kasalan nang muslim.isa pkong christiano nyunit nais ko po mgpakasal sa isang muslim saan po dapat magpakasal at paano po kmi mgpapakasal. Assalamu alaykum brothers, its good to hear that there are soon many masjid here in Phillipines. I'm on vacation but staying in bacoor (molino), do anyone know's if there is any masjid near by to my place. Salamat...pm niyo po ako sa fb account ko hyacienth pearl banting...malaking tulong po..salamat!! !